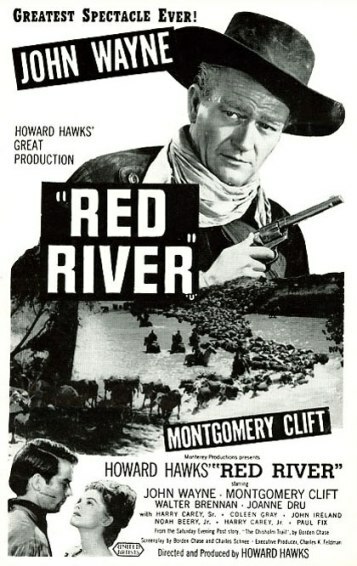 Howard Hawks’ 1948 classic Red River is usually described as a Wild West version of Mutiny on the Bounty, and this is certainly true at a superficial level. Basic plot: in the 1850s and 1860s, the single-minded Thomas Dunson (John Wayne) builds a cattle empire and then initiates a drive – with a herd of thousands of animals – from Texas to Missouri. 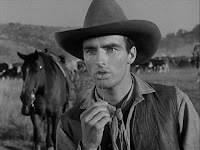 Along the way he becomes so tyrannical and insensitive towards his men that his adopted son Matthew (Montgomery Clift) leads a rebellion against him. But there's a lot else going on in this multi-layered film. It's a psychological drama built on ambition and lust for power. It’s also an intriguing (though not fully developed) look at gender and familial relations – about fathers and sons, about men who haven’t had a strong female presence in their lives, and about women who shake them up. The film buff can see it as an identifiable Hawks creation, with some of the motifs that ran through this great director’s varied body of work. And there’s even a bit of horror movie buried in it, with innocents being pursued (and haunted in their nightmares) by a seemingly omniscient bogeyman, ready to jump out of the darkness. Who knew that John Wayne could be a prototype for Freddy Krueger! 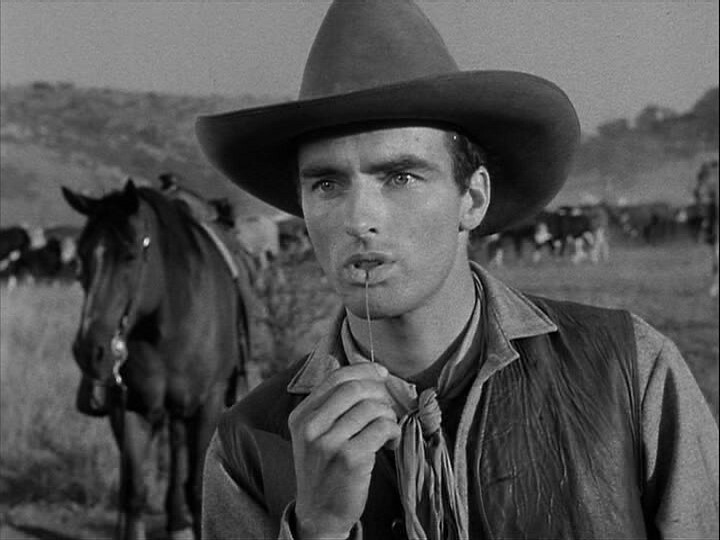 All that said, Red River is first and foremost a brilliant Western, with everything you could want from the genre. It has an acute sense of history – the struggles of the pioneers and visionaries of the Old West, the constant need to shrug off painful losses, look ahead and move on – and strongly written supporting characters, such as Dunson’s old buddy Groot (played by the always-wonderful Walter Brennan). 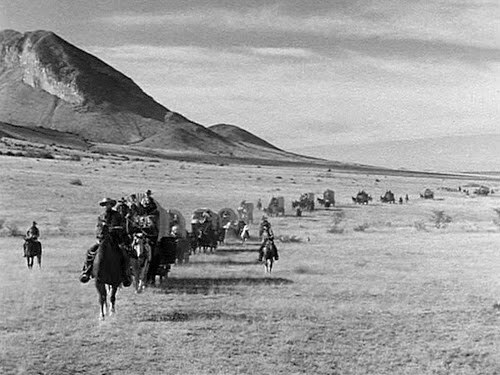 The location shooting is outstanding; there are cattle-drive and stampede scenes that equal any of John Ford’s action setpieces. (What an experience it must have been to see all this on the big screen!) The film is driven by visual storytelling, a point underlined by the fact that though we get occasional glimpses of a scroll of paper with a handwritten version of the narrative on it, the scroll rarely appears on the screen for more than two or three seconds. It dissolves in and out before the viewer has had time to read the full page – you’re left with a basic impression of the first couple of sentences, which is all you really need, because the camera is speaking so eloquently. Always planting and reading! Fill a man full of lead, plant him in the ground, and then read words at him! Why, when you’ve killed a man, why try to read the Lord in as a partner on the job? The emotional vulnerability of Clift is on view throughout the film, but one sees a different sort of vulnerability from Wayne, and it’s especially effective because this is the old-world macho man who doesn’t usually show weakness. Wayne is startlingly good in the scenes just after Dunson leads the shooting of three men who were talking about quitting: watch the paranoid way in which he jerks his head around and says “Where are you going?” when he sees Matt walking away, or the way he looks at another man who he thinks might be reaching for his holster. You get the sense that Dunson inwardly realises he is being unreasonable, but that he can’t swallow his pride. Soon he becomes a control freak, refusing to sleep so he can keep an eye on all the men, all the time (this is, of course, an indication that he realises he can no longer trust anyone). 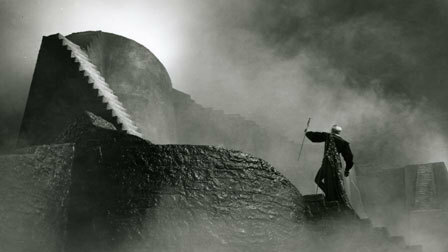 The sleeplessness motif will be repeated later in the film, when Matt and his men are plagued by nightmares about the vengeful Dunson tracking them down. (“Every time you turn around, expect to see me, because one day you’ll turn around and I’ll be there.”) You won’t see many other great Westerns populated by insomniac and fearful men, but like I said, this film is a genre-bender. 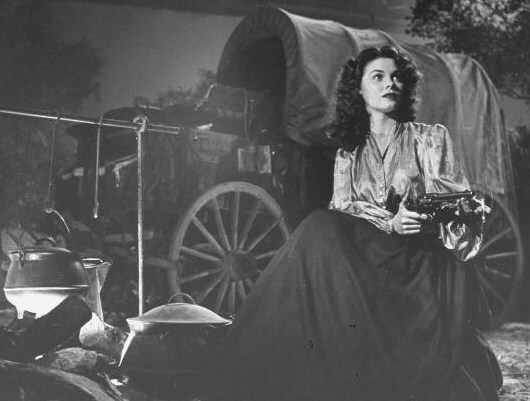 The fog in the night scenes also creates a look and atmosphere that is very unusual for a Western – you can cut the tension with a knife. In fact, some of the later scenes in Red River remind me of two other great films made in the same year: John Huston’s The Treasure of the Sierra Madre (with gold prospectors driven by greed, eventually in danger of losing their sanity) and – would you believe it – Laurence Olivier’s adaptation of Hamlet. Think about the Danish prince being approached on a misty night by his father’s ghost, and then watch the scene in Red River where Matt wanders restlessly about on a foggy night, dreading Dunson’s arrival. In Olivier’s film, the role of Hamlet’s mother Gertrude was played by an actress who was more than a decade younger than Olivier – this underlined the story’s Oedipal theme, turning the Hamlet-Gertrude-Claudius relationship into a twisted romantic triangle. In Red River, the main female character Tess has a similarly ambiguous relationship with both Dunson and Matt. There are two women in Red River; they are never seen together, but there is a strong symmetry in their roles, and in how they affect the central relationship between Dunson and Matt. 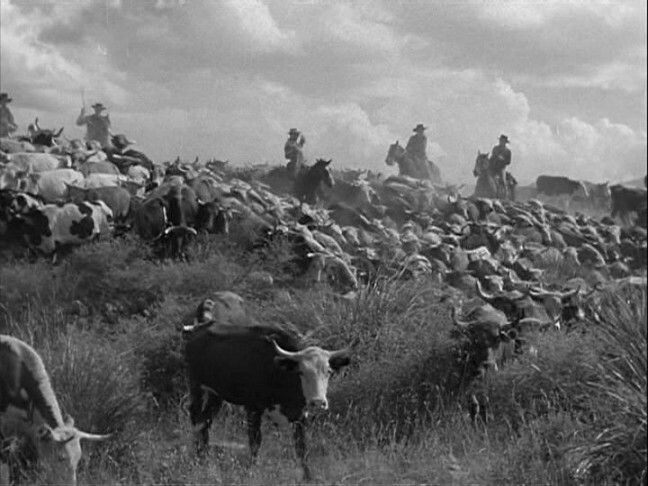 Very early in the film, the young Dunson loses his girl Fen in an Indian attack (after he’s told her not to accompany him – he’ll return for her later). The very next morning, the boy Matt comes into his life, eventually becoming his adoptive son. Fourteen years later, shortly after the conflict between Dunson and Matt, Tess (Joanne Dru) enters the picture, becomes romantically involved with Matt, and sets about playing agony aunt and relationship-mender (in a striking scene where she wears a flowing black gown, she looks very much like a maternal, Madonna figure). When Matt leaves Tess behind, promising to return for her later, it’s a repeat of Dunson’s promise to Fen, but with a twist: shortly afterwards, Dunson arrives and agrees to take Tess with him. He’s showing some flexibility for the first time, which represents a major progression in his character – it should help the viewer prepare for a reconciliation and a happy ending. If it were possible for an otherwise great film to be ruined by its last one minute, this would be a candidate. But Red River is such a complex and satisfying movie in other respects that it almost doesn’t matter; when you think about it a few days after watching it, you’ll only remember the good bits. And wish you could see it in 70 mm. Related posts: on the John Wayne star persona in The Man Who Shot Liberty Valance; and on A Streetcar Named Desire (which also had two leads who represented different acting styles – also see the comments discussion). I found the Clift character a little too idealised for my liking. Especially the saintly way in which he refuses to retaliate when Wayne fires all around him towards the end. This film was a part of a very rich period in Wayne's career. Between '48 and '50, he worked in a number of very unconventional westerns. Red River, Fort Apache, She Wore a Yellow Ribbon, Rio Grande and 3 Godfathers were all released in this 3 year period. Each film so very different from the other and each one with a very distinct John Wayne persona. I can't think of any other actor in movie history who has acted in that many great films in a space of 2-3 years, barring perhaps Stewart in the fifties. To my mind, Wayne is THE most underrated actor in movie history. It's interesting that many of these Ford/Hawks westerns are dubbed as "classic" and contrasted with the so-called "revisionist" works of Peckinpah/Leone. But the reality is that these 40s westerns are just as unconventional as anything from the 60s/70s. Many of these "classic" films often challenge the moral primacy of the white male as opposed to perpetuating conventional myths about American Westward expansion. Shrikanth: well, let's just say he was one of the most underrated actors among those who spent most of their career in leading roles (always a bit wary of sweeping statements!). Btw, I was reading a Howard Hawks interview in this great book yesterday, and he mentioned a conversation with Lee Marvin once, where Marvin wanted to make a Western "but not one of those John Wayne Westerns". To which Hawks tersely replied, "Yes, that would be quite difficult - you're only one-third as good as Wayne was." Must have been quite a comedown for Marvin the "serious actor"! Shrikanth: in general, I get really fed up (and quite surprised as well) by the patronising attitudes towards old films that I see in many of today's reviewers/movie buffs. Even when they praise the films, there's an underlying assumption that those movies were "great in their time" (it's a phrase I see used so often) but that cinema has clearly moved on and become more sophisticated/superior in some overriding sense. 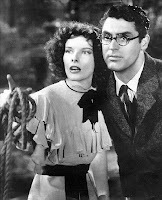 I recently saw a couple of Tweets by an Indian mainstream movie reviewer (and a fairly good writer/serious film buff at that) who was saying some nice things about 1940s and 50s Hollywood films including some by Ford, Stevens, Wilder, etc - but it was hard to miss the faintly condescending tone; the sense that he felt those movies were essentially naive and that modern viewers need to be indulgent towards them. Really annoying. Jai: Thoroughly agree. But I suppose it can't be helped. Every era has its own conceit. One can sense an attitude of condescension towards the silent era in Wilder's Sunset Boulevard for instance. This attitude of condescension towards the past pervades sport commentary as well, going by the surfeit of Bradman vs Tendulkar comparisons that hog the internet, notwithstanding a very vast difference in their batting averages. 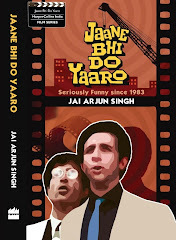 An excellent, excellent post Jai. It is particularly fortuitous because I saw the film only three days ago. As an aside let me mention that there are those in the US who believe that Wayne's conservative politics often get in the way of an honest assessment of his abilities as an actor. Thanks, Mayank. I think it might have been a case of Wayne's conservative politics wedded to his macho reputation on screen - and the fact that the gung-ho ideology often spilled over into his films, especially the ones he directed. James Stewart was politically conservative and hawkish too, but he was a more versatile actor overall and his screen persona was gentler and more nuanced - which perhaps meant that people could watch him onscreen without thinking about his politics. Btw, in that Liberty Valance post, I've mentioned Kirk Douglas's recollection of Wayne telling him that actors like them should be playing "strong, tough characters" - though Wayne's performance in films like Red River did suggest that still waters ran deep. Yes Jai, indeed Wayne's political ideology meshed with what he made did create a combination that may not have gone down too well with the largely liberal Hollywood establishment. You are right about Stewart who was able to soften the blow as it were. I am going to buy the Red River DVD. Your book should be arriving soon. 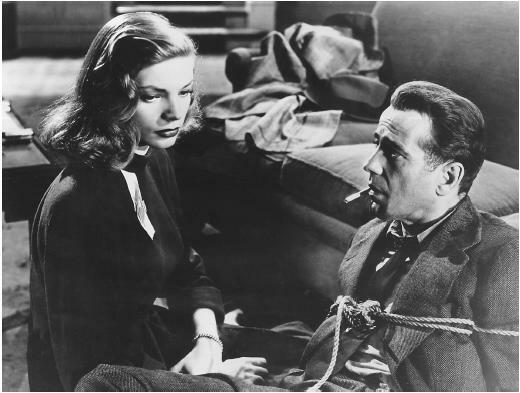 mayank: I don't think the Hollywood establishment was all that "liberal" back in the 30s/40s. Louis B Mayer was a Republican. So were several major figures including Wayne, Stewart, Capra, Gable, Cooper, Ward Bond and ofcourse Will Hays! What else can explain the neglect of several popular classic westerns of the fifties even by good critics like Ebert. On the other hand, relatively lesser movies like To Kill a Mockingbird, Inherit the Wind and High Noon have become a part of the popular culture. Its always hilarious when Indians try and write about good cinema. Shouldn't you be wobbling your head from side to side and watching men in tight silk shirts dancing around women in Bollywood crapola? Shouldn't you be wobbling your head from side to side and watching men in tight silk shirts dancing around women in Bollywood crapola? Anon: oh but I do that as well, and with tremendous enthusiasm! 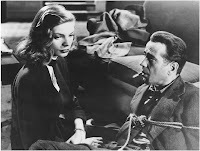 Only this April, in midst of the fest, these classics were put up on the "big screen" - The General, Fritz Lang's M, La Grande Illusion, The Wages of Fear, The Night of The Iguana, The Americanization of Emily and Comanche Station. I saw Lang's M & The Wages of Fear for the first time. Have you reviewed any of these? I'd indeed love to see your writing on these classics.